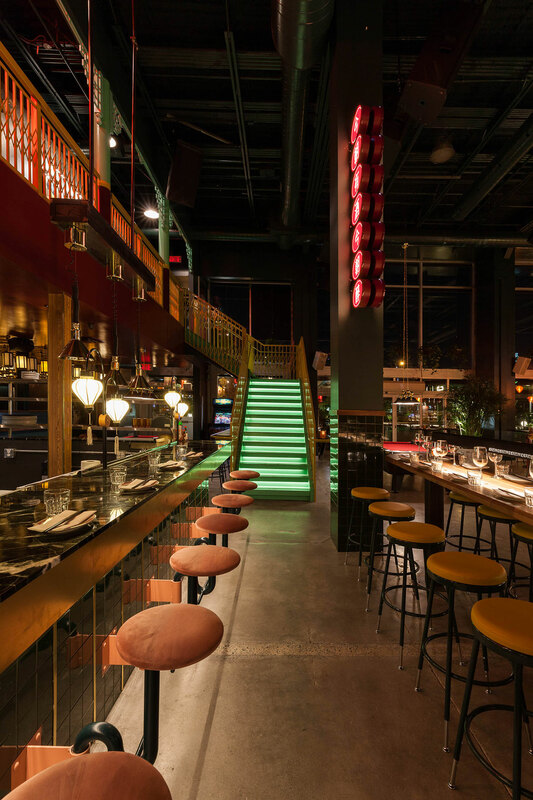 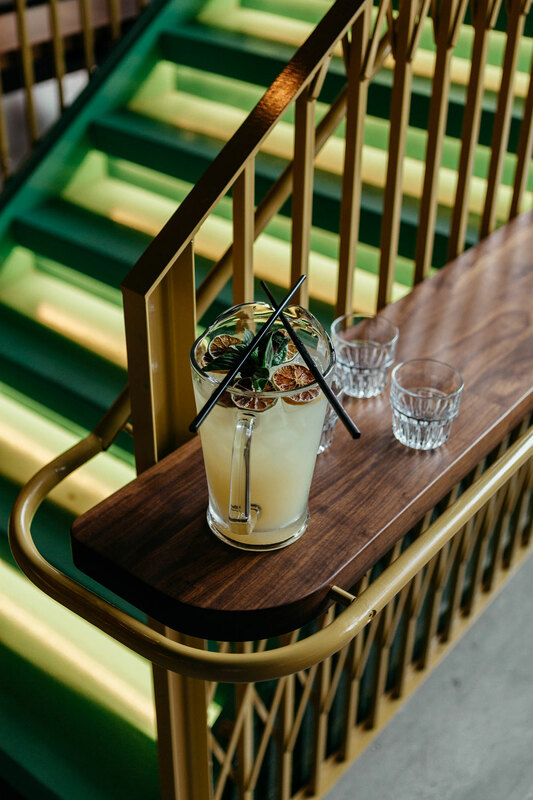 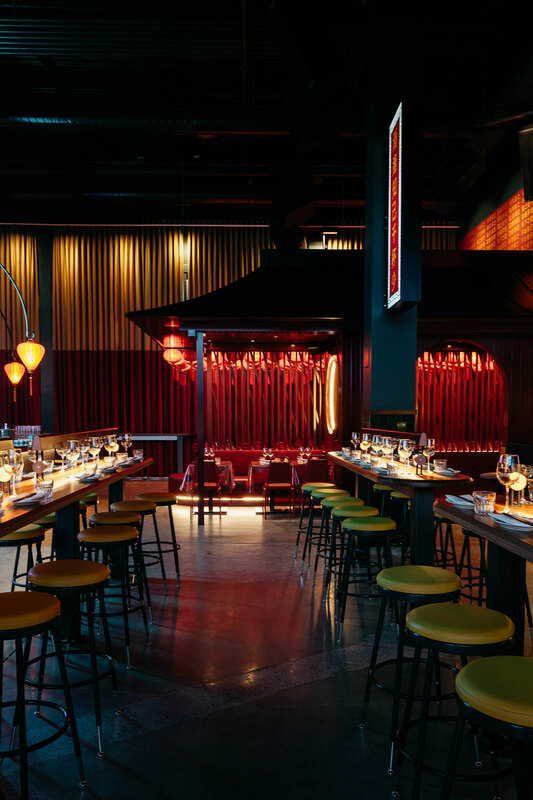 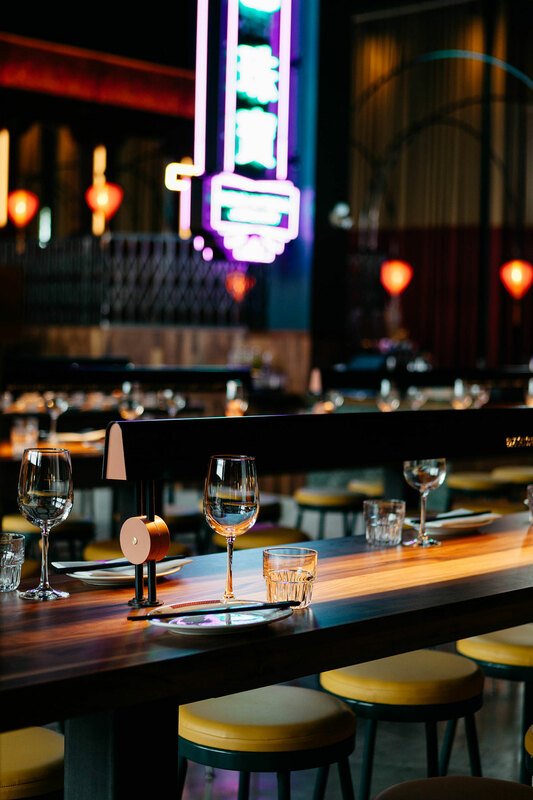 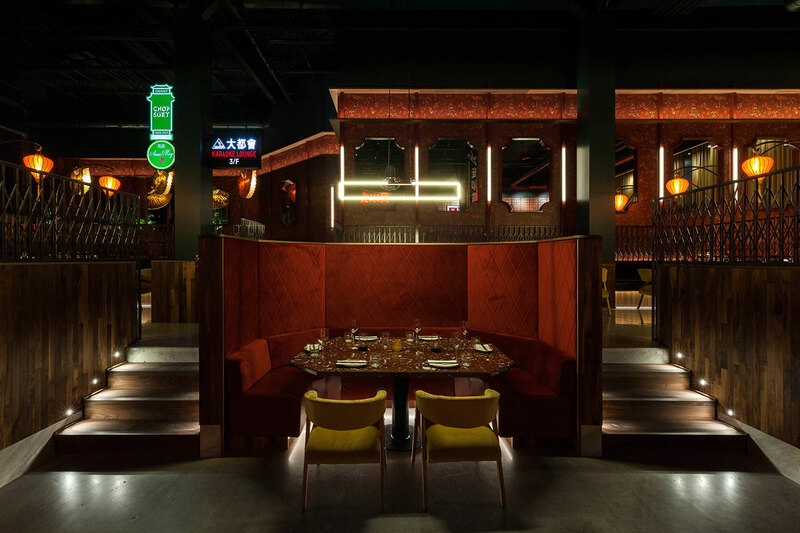 Occupying a former nightclub in Laval, a Québécois city next to Montreal, Miss Wong is a new Asian brasserie inspired by the urban exoticism of the Far East. 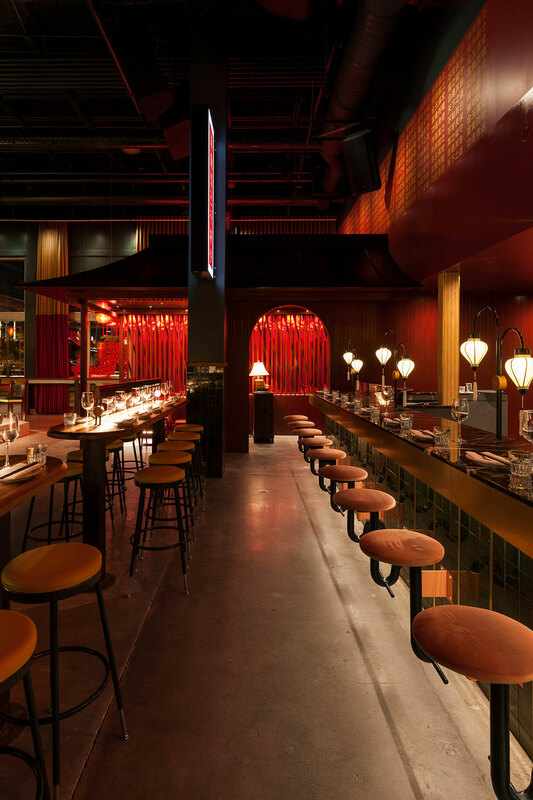 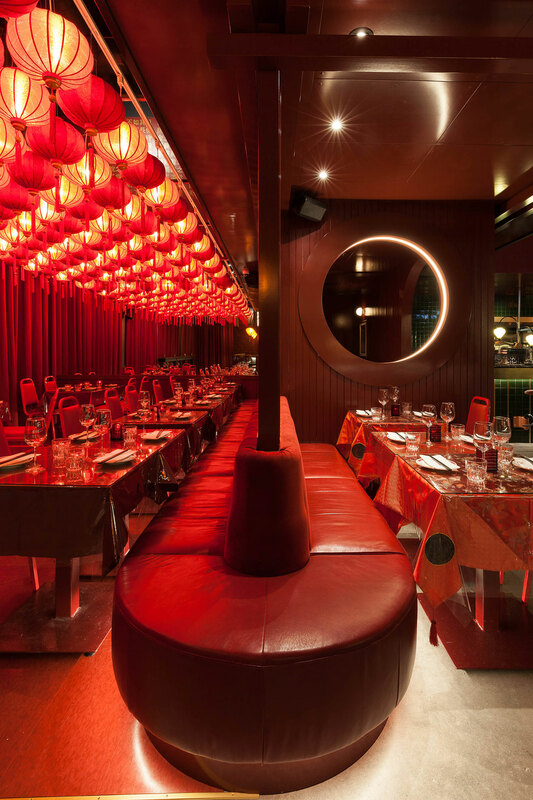 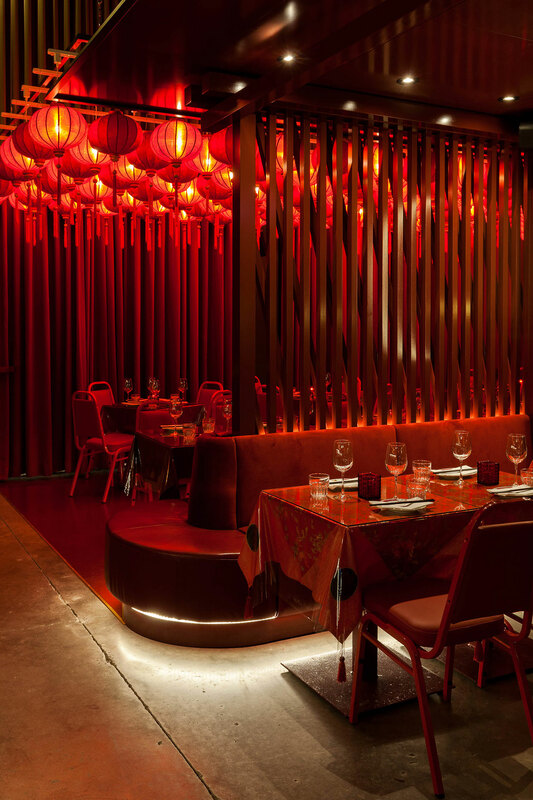 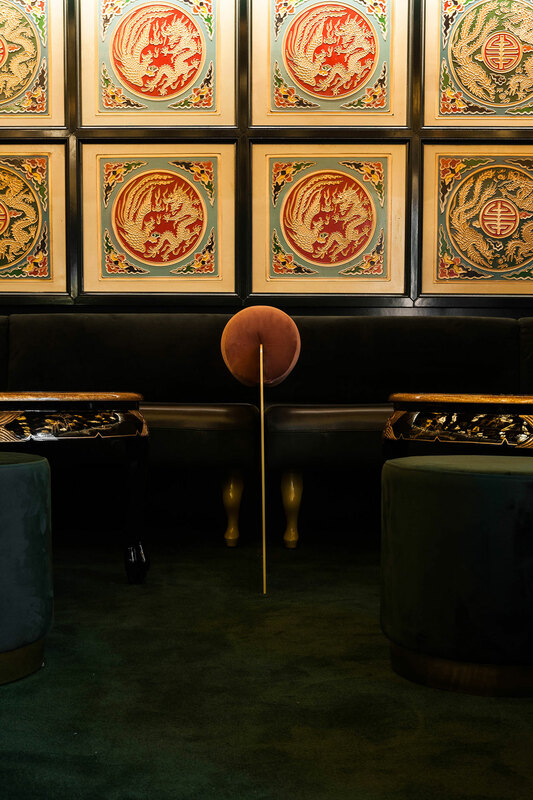 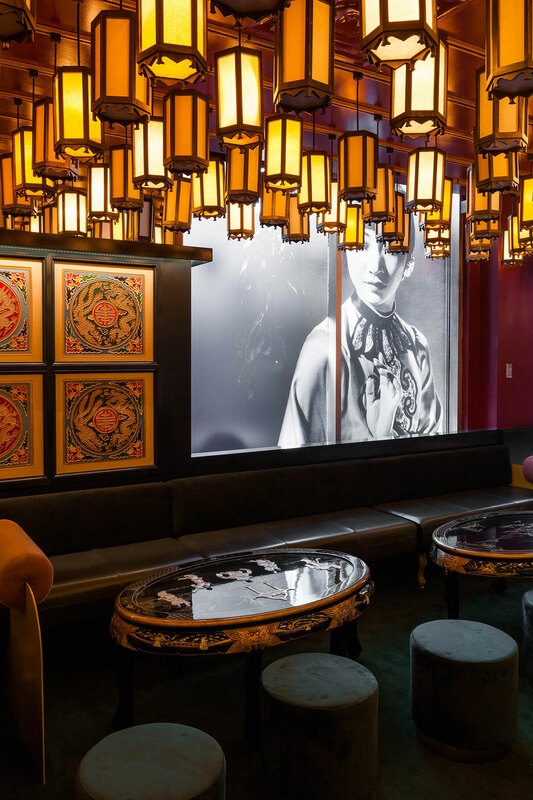 Named after the famed 1920s and 30s Chinese-American actress Anna May Wong, the restaurant was designed by Montréal-based studio Ménard Dworkind Architecture & design (MRDK) as a reflection of the oriental exuberance of mid-century Hong Kong, albeit filtered through the kitsch aesthetic of Chinese-American restaurants from the 1970s, which the architects encountered when visiting the Chinatowns of San Francisco and Vancouver. 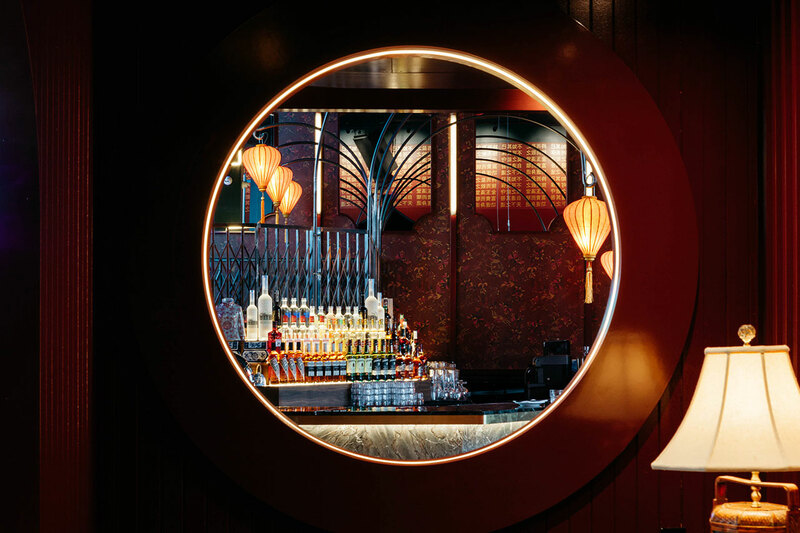 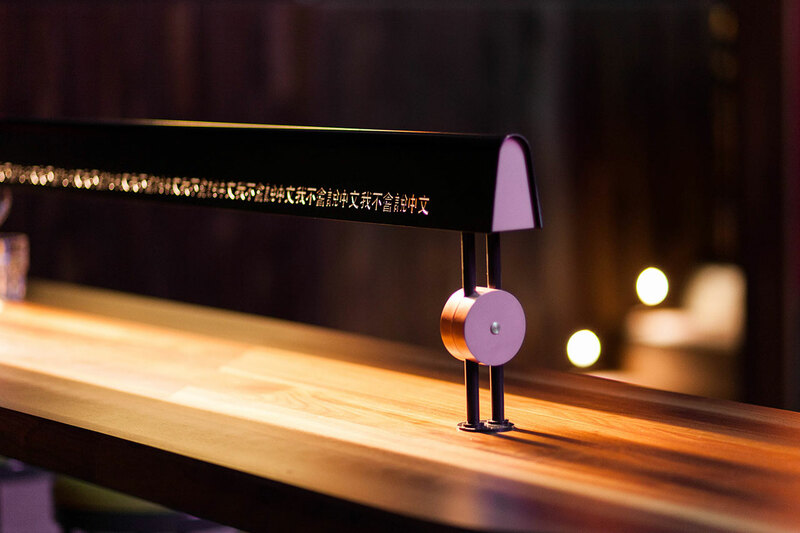 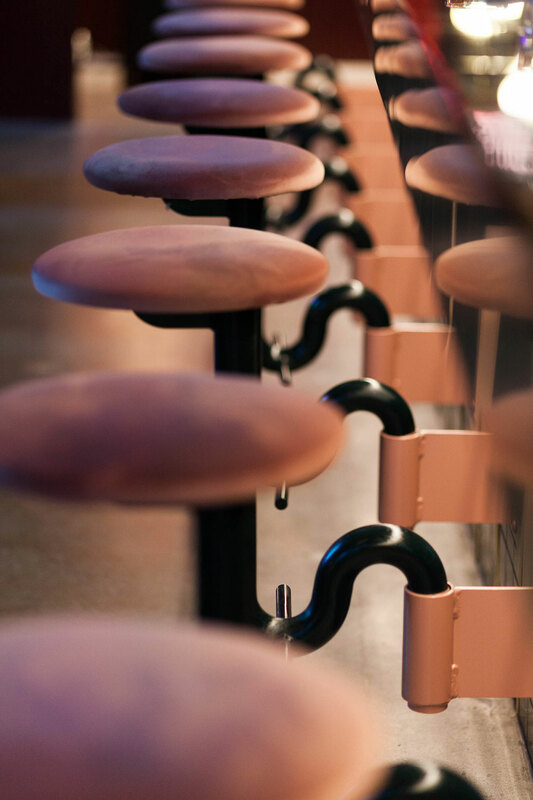 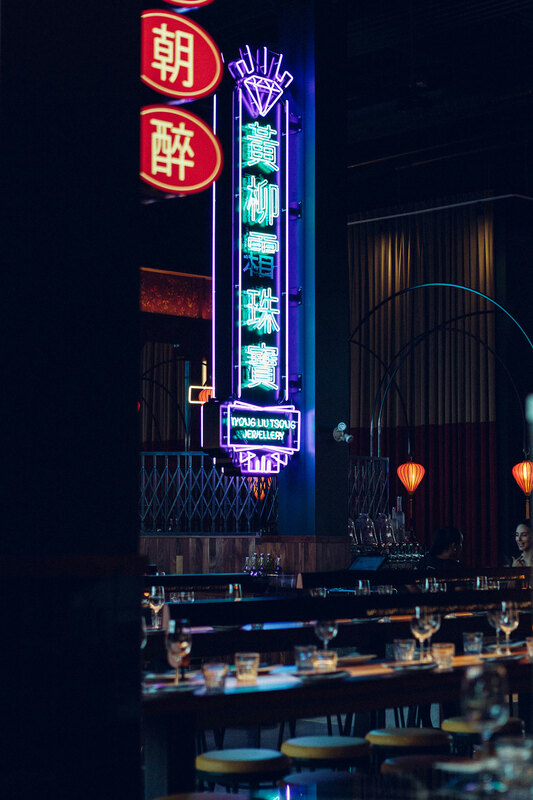 Based on a modern-fusion menu led by the Vietnamese-Montrealer chef, Phong Thach, Miss Wong offers an immersive culinary experience of cinematic proportions. 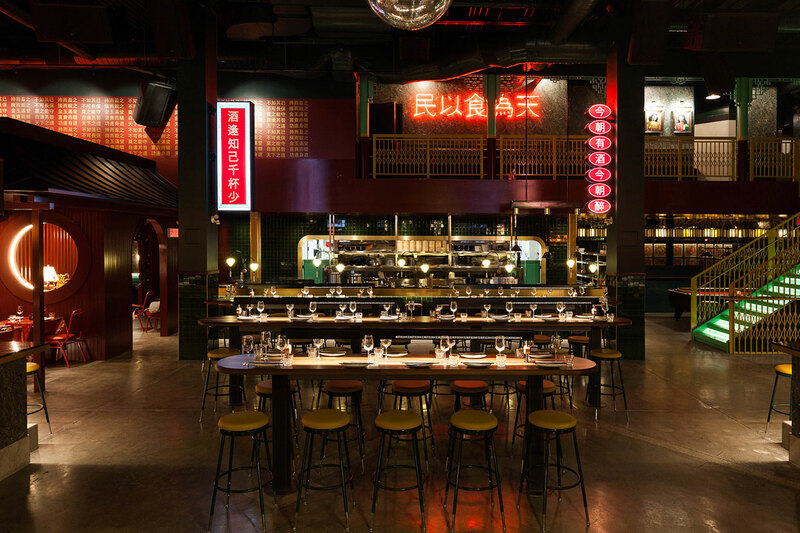 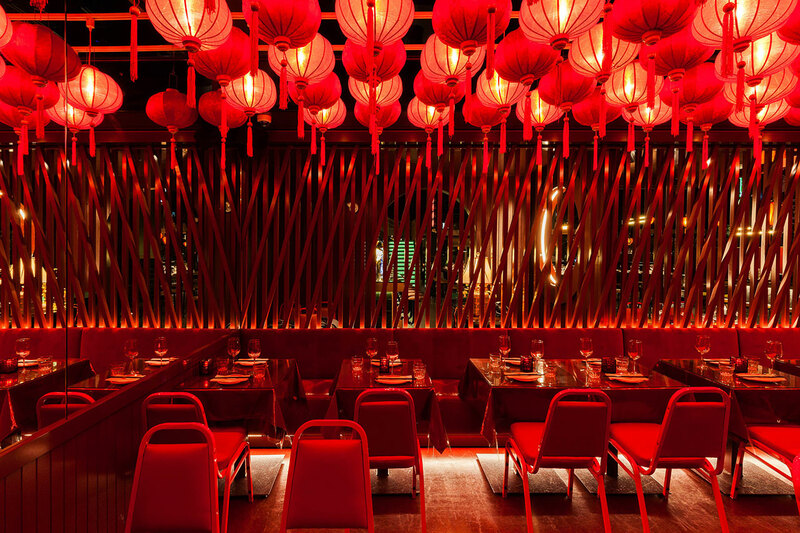 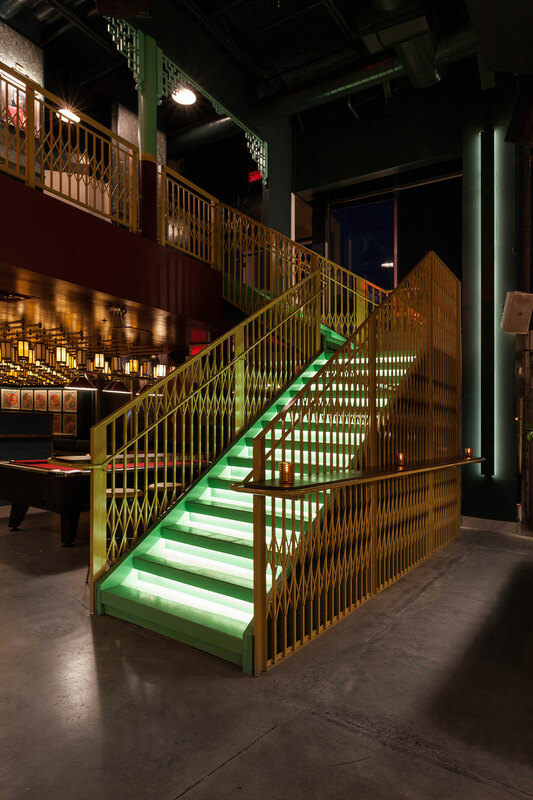 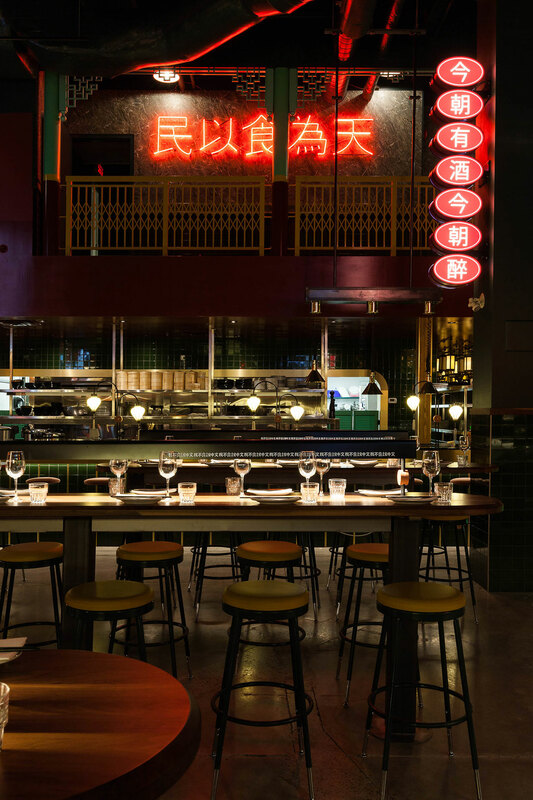 Architects Guillaume Ménard and David Dworkind have taken advantage of the venue’s large central space to create their own nostalgic version of Hong Kong’s streets, complete with colourful neon signage, classic folding scissor gates, jade-patterned walls and hanging lanterns. 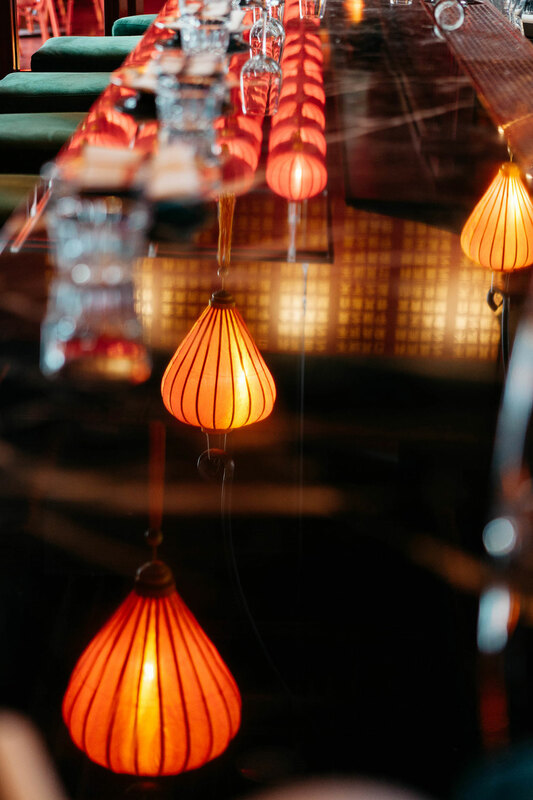 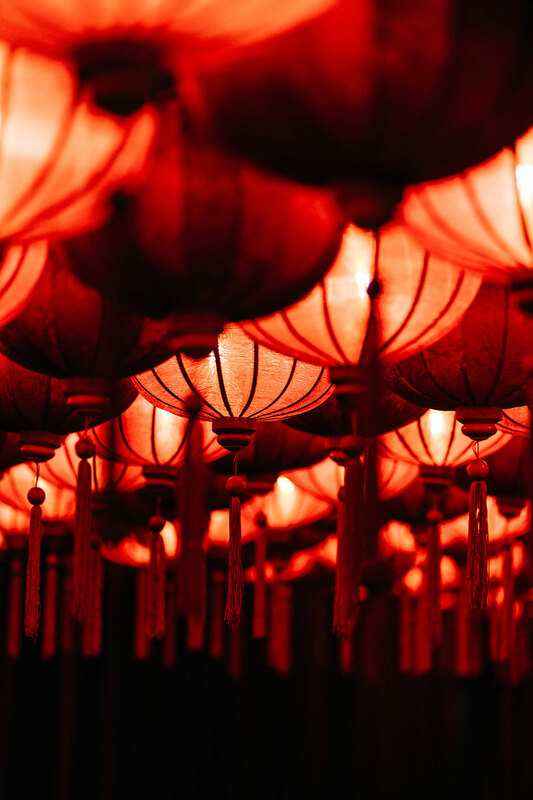 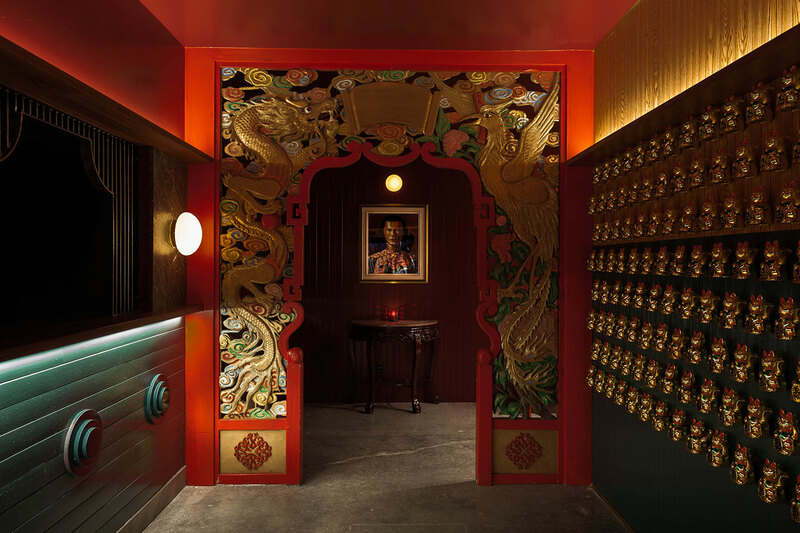 Entering through a low ceiling vestibule where you pass through a vintage Chinese arch that frames a portrait of Miss Wong herself, the restaurant’s expansive 930 square metre space with ceilings that soar almost 7 metres in height takes your breath away with both its size and vibrancy. 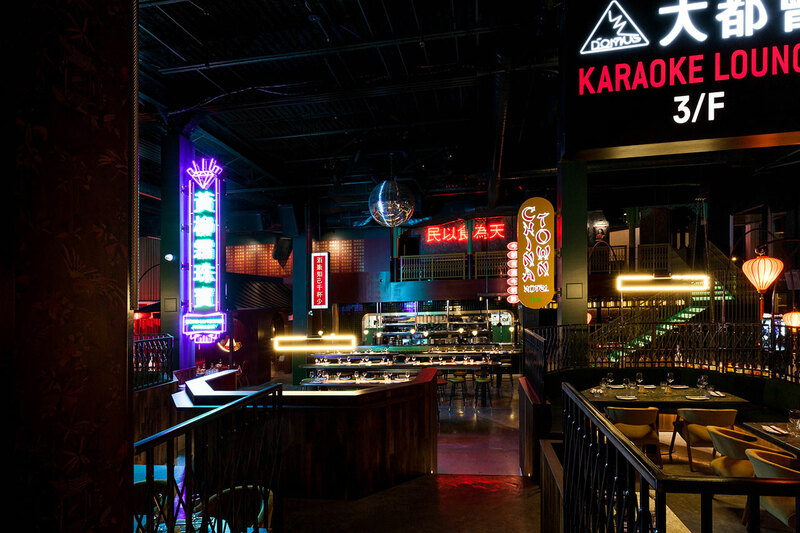 Resembling a film-studio, the main area is centred on two symmetrical bars and features several large neon and lightbox signs that advertise fictional Chinese shops. 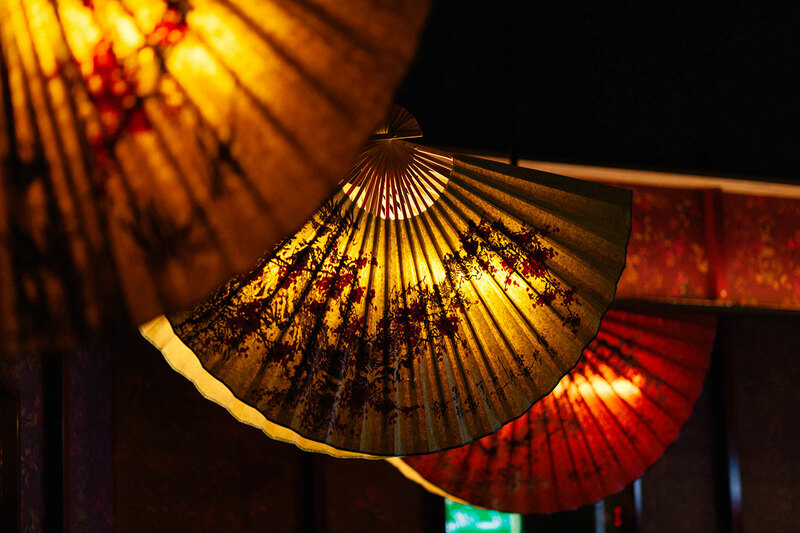 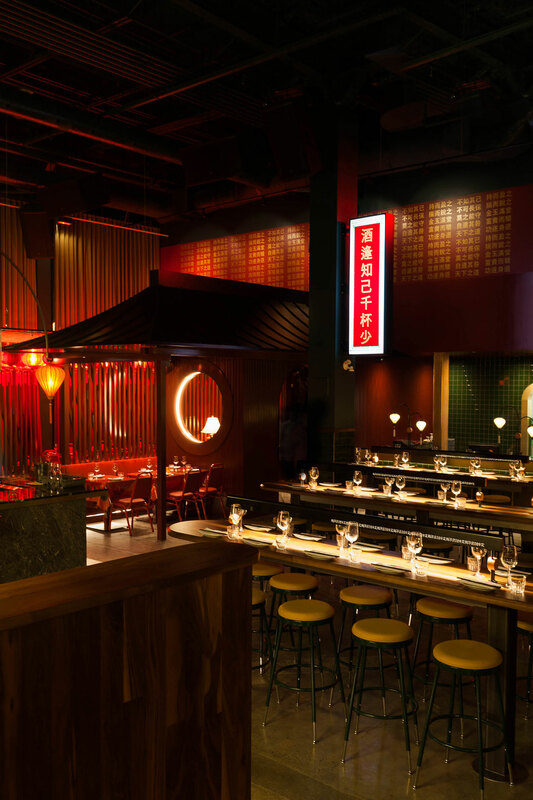 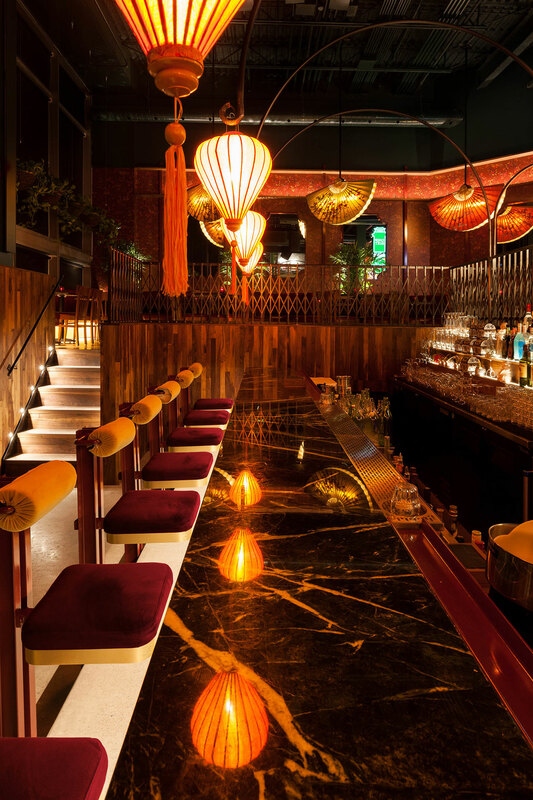 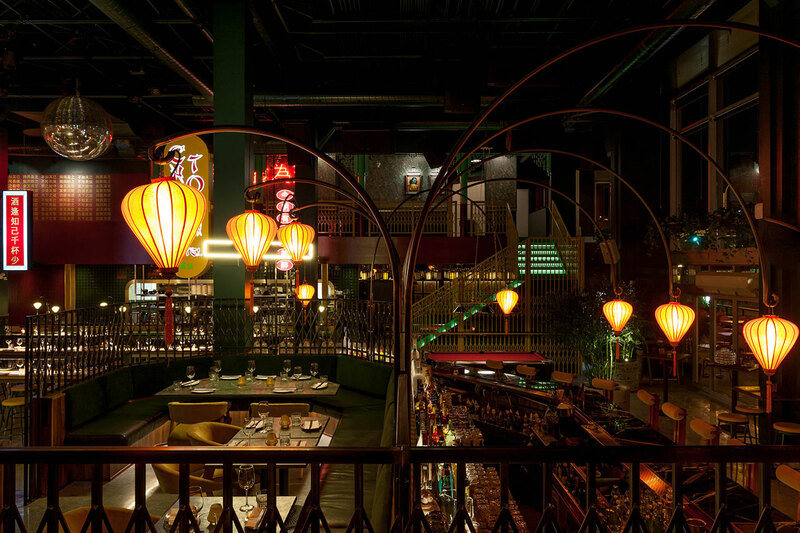 The signs, along with the bespoke lamps on the tables and the black-painted ceiling create the impression of a night-time Asian street market, enhanced by the introduction of a Chinese garden-like terrace, a Chinese pergola structure and plenty of lush vegetation. 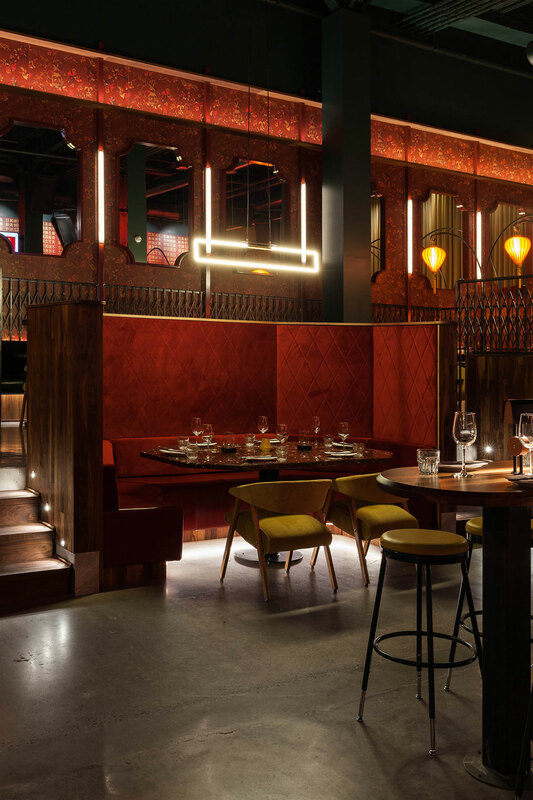 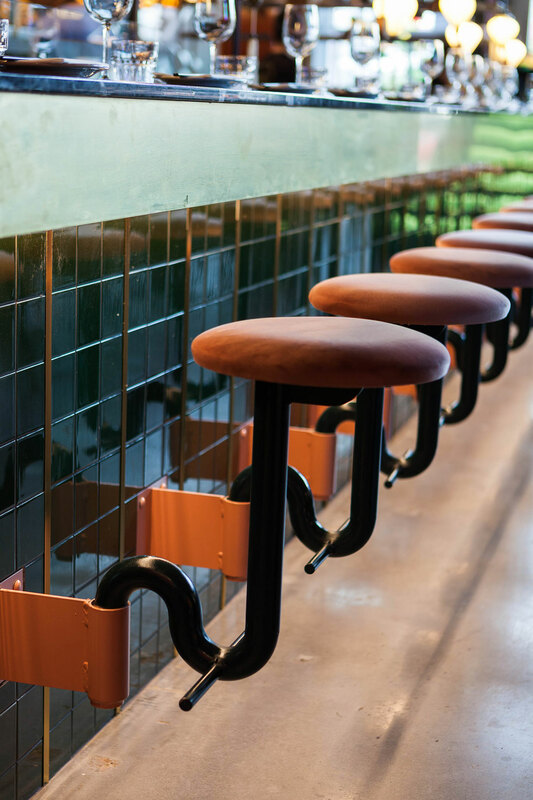 On the restaurant’s periphery, tucked away from the hullabaloo of the central hall, the architects have created four distinct zones that offer guests a more intimate dining experience. 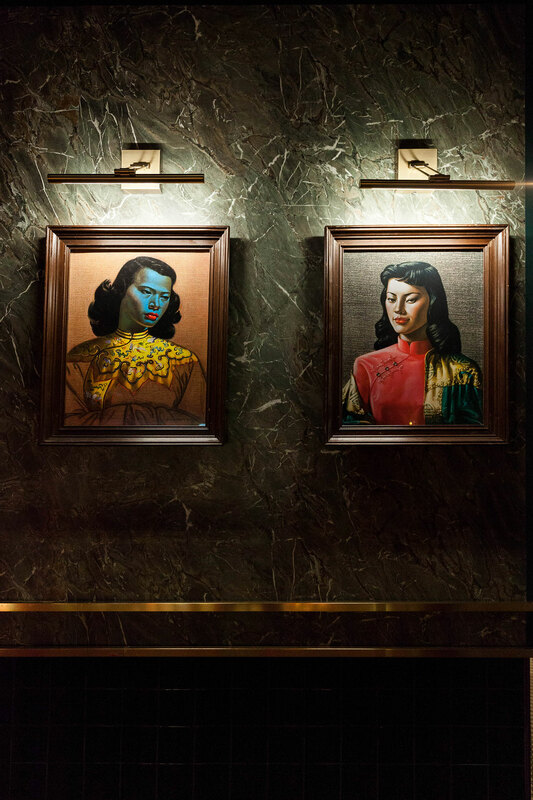 Featuring bespoke furniture and light fittings inspired by Chinese popular iconography, each space conjures a different sensibility, from the decadent opulence of the “opium den”, to the red lantern-filled room that channels the sensual romanticism of Wong Kar-Wai’s film “In the mood for love”—Wong’s name is certainly no coincidence. 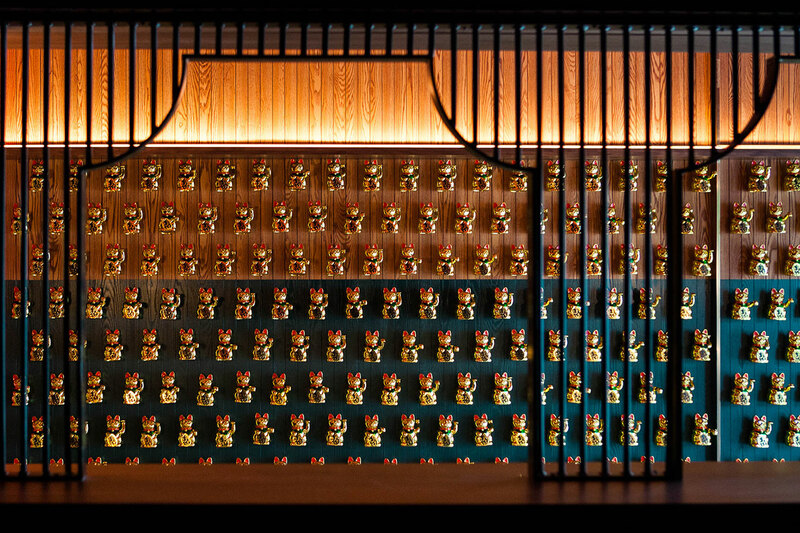 This mesmerizing, multifaceted scenography is ideally suited for Miss Wong’s late night transformation into a speakeasy-style bar where patrons can enjoy an exciting line up of DJs along with a menu of bespoke cocktails such as the Silk Road Spritz, the Big trouble In Little China, and Le Moomba, the latter a fitting tribute to the venue’s previous incarnation as a nightclub.